Preparation time: 25 minutes. Baking time: 30 minutes. Preheat oven to 400°F. Melt margarine in a large saucepan over medium heat. Stir in flour, salt, garlic powder, pepper, parsley, and thyme; a thick paste will form. Whisk in water and 3/4 cup milk; add bouillon cubes. Continue to stir with wire whisk until mixture thickens slightly. Add mixed vegetables, onion, and chicken; stir to combine. 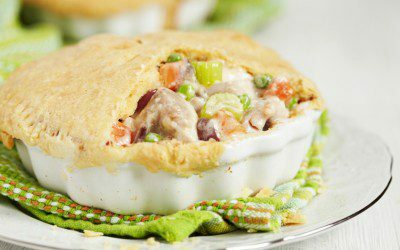 Spoon into a 2-quart casserole coated with cooking spray and set aside. In a mixing bowl, combine baking mix and 2/3 cup milk and stir until a soft, sticky dough forms. Drop dough by rounded tablespoonfuls on top of the chicken mixture. Bake uncovered for 30 minutes or until topping is golden and filling is bubbly. Exchanges per serving: 1 1/2 starch, 1/2 vegetable, 1 very lean meat, 1 fat. Carbohydrate choices: 2.